Perseverance Records is proud to announce the reissue of the soundtrack to the Michael Mann thriller, Thief. The first 50 CDs will signed by Chris Franke and Craig Safan!! Thief was Michael Mann’s directorial debut. The film featured James Caan as a professional safecracker who agrees to do a job for the mafia. Many consider this film to be James Caan’s best role to date. Also starring Tuesday Weld, James Belushi, Willie Nelson, Dennis Farina and a number of professional thieves as well as police in supporting roles, the film is now a classic of the 1980s. 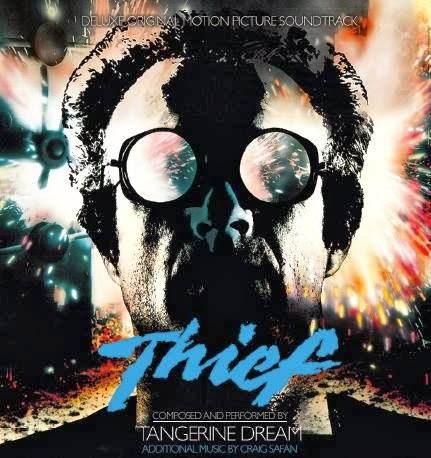 Scored by Tangerine Dream, it has become one of their signature film scores. Multiple versions of the score have been released over the years. Our release contains both Confrontation and Beach Scene, depending on what previous version of the LP or CD was sold, either of which were left off of previous reissues. In our opinion, this is one of the best electronic scores of the 1980s, and we are happy to bring it back with a limited edition run of 4,000 units. Many missed out on the last reissue, so we are happy to be offering this with the proper track list. My wife digs Tangerine Dream. I wonder if she has this one?